You are one active lady. I don't know how you find the time. I would like to learn yoga. We do have it on the Wii but it seems I am always so busy that I don't take the time to do it. As I said yesterday, you are an inspiration. I wish you nothing but the best on 2012 and look forward to reading of your progress. Wow Lisa! Any type of running while pushing a stroller is pretty hard work. That is amazing that you went up a mountain!! I have a gym membership, but don't use it. I need to go and put my son in the play area even if he doesn't like it. Now that's impressive that you pushed Pierce up a mountain in a BOB, even walking some sections! That sounds like a great workout! This was inspiring to read! I have been struggling with some health issues since my twin pregnancy, but I am eager to at least get back into regular exercise, even if I never can convince ,y body I'm a runner! getting over 1,000 miles in is amazing to me! and the fact that you did it after being side-lined for almost 1/2 the year is phenomenal!!! go, lisa, go! stay healthy! You, Ma'am are my hero!! I have never ran in my life, save the time I did when I was playing rugby in highschool but even then I could not run the 5k our coaches wanted us to. My husband is a runner. His goal is to run a half marathon. He pulls out 5k no problem, like it's a cake walk or as he says "A cake walk in the park!" lol. 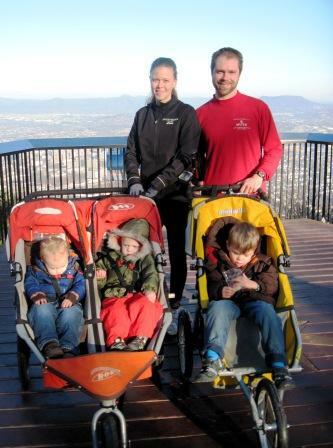 My fitness goal for 2011 was shot because I found out I was pregnant with our third son. My fitness goal for 2012 is to drop 40 lbs. I've already lost 20lbs but this last 40 is going to be a killer. For now, because I am essentially raising all three kids on my own all I can do is get excercise by chasing them and eating healthy. Oh, Lisa, you made me tired just reading all that. Just kidding! I really admire you and I'm happy your injury got better so you could do what your really enjoy. And reap the benefits of it all. Congrats! I just try to continue having fun.I put in a little over 12 miles the last two days off, but normally try for 10 a week. In spite of your injury, I think you did remarkably well. I need to get into a workout routine again, but it won't be running! I'm jealous! I don't have the time. With 4 kids and a home daycare business - by the time I can do anything for myself it's dark! I think we've decided to get a treadmill - because then I could work out around 5am before everyone else is up and our day starts. Regrets? plenty.. no lot's more than plenty. 2012 I hope is kind to me..
You are inspiring to me! I used to run and kind of got out of it a couple of years ago. There really is nothing like it for fitness, mental clarity, and weight control. I need to get back at it! You are a workout machine. I love that you include your kids in your marathons. They are learning great healthy habits from you, you should be so proud! Hi Lisa, I think you did well in 2011---despite your injury... I'm proud of you. You have some great goals. One of my goals is to cook a bit healthier. Oh Lisa, You set such a wonderful example! But if I tried to run I'd keel over by the time I got the end of the block. I do like to walk on the path down by the creek. Oh how my moms wishes she could be engergetic as you- I wish she could find my own inspiration, and do it. Wow, those are really awesome goals! I am happy to just get a walk in every day. I can't even imagine doing a half marathon or anything! You're awesome! I had to smile how you called 1000 miles a light goal. Though it sounds like that will be light for you when you're injury free! I'd say you finished off 2011 on a good note! That's a lot of mileage after an injury like that. Look how cute you all are! I am so impressed by all that you do! This year my only goal is to be more consistent in exercising and to run more. You are adorable! You motivate me! I am actually heading to tennis right now so a step in the right direction! Your running mileage is incredible!